Going the extra mile can make the difference between keeping a client’s business and wondering what went wrong in your business relationship. Here are 25 easy ideas to express customer appreciation. Send Coupon Cards - These perennial favorites work great to slip into a client appreciation card. If you know your client does business in the area, a coupon card works great for their discounts on their business lunches, long nights at the office and travel. Attach a note that reads, “Enjoy these extra savings because we're extra thankful for clients like you." Perk Up - Caffeine makes the office go ‘round. Pick your favorite coffee shop(s) around town, and arrange a monthly delivery of favorite coffee blends. It’s a nice treat to switch up from Folgers and Starbucks. Recommend a Favorite - Your clients will love a chance to get out on the town and try out the latest restaurant, ice cream parlor or brew-pub with a gift card. It’s a straightforward but thoughtful gesture that you can slip into a thank you note. Take a Tour - Many local restaurants, breweries and wineries offer a chance to sample and try out their newest arrivals. Arrange a group to get together and try the latest trends. 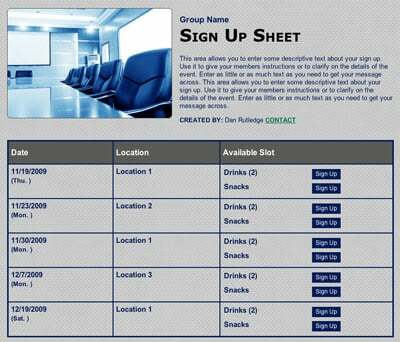 Plan a client happy hour with an online sign up! SAMPLE. Plan a Food Truck Rally - Bring a food truck to your business for an afternoon or evening. Add a note on a chalkboard that says, “Let us treat you to lunch because it's a treat to have you here” or add a note to the chip basket, "You're all that and a bag of chips." Take Them to the Donut Shop - Schedule a client breakfast at the new donut shop in town (a classic favorite also works well). 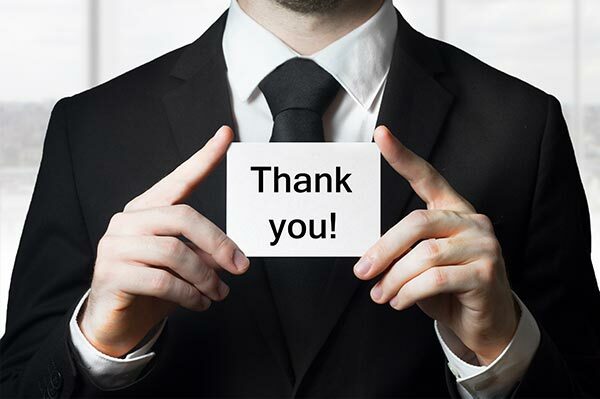 Send your clients or staff an invitation saying, "Do-nut know how to thank you enough." Paint with a Purpose - Treat your clients to a night out at a local craft shop or painting studio. Arrange for the project to be related to the company — for instance, a business slogan or logo. Your clients will have something fun to add to office décor. Include the appreciation tag line, "Thanks for adding color to the office." Plan Breakfast with Santa - Host a customer appreciation event that involves the whole family. Invite Santa for a fun breakfast at a favorite restaurant or your company’s office if there’s space. Add a note that reads, "Thank you merry, merry much" to place cards or the menu. Host Yoga on Tap - These events are popping up at breweries and exercise studios across the country. Plan an after-hours event at the office or rent out space to bring in clients for meditation followed by their favorite beverages. Include a voucher for another free class (in case they can’t make it or decide they like the concept so much). Get Personal - No need for engraved pens here. Think of a promotional item that incorporates your company’s brand and the client’s interests. Popular items include a monogrammed bag, water bottle, sticky notes or lip balm. Go Digital - Not all gifts need to be held. Does your company do design or software work? Create personalized business cards or digital signatures for clients. A funny animated thank you card also can be very memorable. Travel Right - Have a client who’s a frequent flier? Send them a travel kit that includes luggage tags, a neck pillow and Starbucks gift card. Make Memories - Did your customers recently participate in an event or campaign you hosted? Send them a photo card or photo book with pictures of the event inside. Host a shred-a-thon for clients with an online sign up! SAMPLE. Race for Donations - Invite your clients to get involved in a local race that you know matches their personal or company values. Offer to match any fundraising they undertake. Attach a note that reads, "Thanks for going the extra mile for us." Pick a Holiday Charity - Pack shoeboxes, start an angel tree, fill backpacks or collect shoes and toys. Ask for customer input, and pick a charity that is near and dear to them. Tell them you will match all their donations the months of November and December. Let them know they matter with a note: "Thank you for giving us a hand" or "You're hands down the best." Close to Do Good - Do your customers need something painted or renovated? Would they like mulch in their gardens or weeds pulled in the common area? Close up shop for a day and invite your customers to come participate in a day of community service, team building and giving back. This is a great way to give back and get connected. Meals and More - Invite your customers to help you cook up a meal at the local Ronald McDonald House, nursing home or homeless shelter. Make the donation in their name or business name. Bake cookies to take to the local fire department, police station or emergency personnel center. Make a Match - Offer to match their donations drive up to a certain amount if your client has an annual cause they support. Come together to help them set or exceed a giving goal. Plan a race for charity with an online sign up! SAMPLE. Pick the Best in Business - Send your favorite business book to clients. Make it personal by writing your top five takeaways on a bookmark. Plan a Mixer - Host a cocktail hour for your clients so they can get to know each other. Most people will jump at the chance to make new business connections with a friendly crowd. Host a Lunch and Learn - Bring in a big-name speaker and invite clients to learn more about your industry — or get general professional development tips — from a thought leader in the field. Plan a Professionals Picnic - Host a picnic with professionals from your organization. 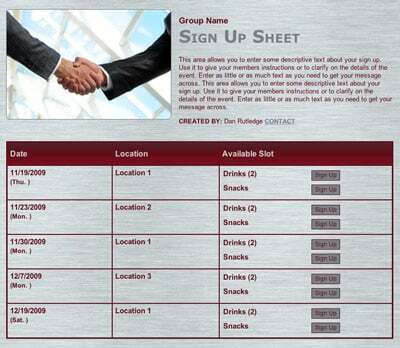 Give customers a chance to mix and mingle with other professionals at your organization. Set Up Speed Networking - Give everyone in your customer base a chance to meet with the CEO, CIO or another top manager. Plan a speed networking night where customers and top clients can borrow time with each person in the room. A little effort goes a long way. Mix in some of these ideas throughout the year, and you’re sure to have happy customers. Christina Kaemmerlen is a journalism junkie, burrito lover, Tar Heels sports addict, manic mom and loving wife living in southern suburbia. Plan lunch and learn sessions with an online sign up.